December is used to moving in and out of foster homes and schools, with almost no constants in her life. It's a good thing she knows that she's really a bird, awaiting transformation, so those human connections wouldn't serve her well anyway. But when she starts to find herself liking her new foster mother and making a friend, what will become of all her plans for flight? Just like the birds she loves, December is slightly otherworldly and mysterious, but also like them, getting to know her is worth it to uncover the delicate and poetic beauty beneath her surface. 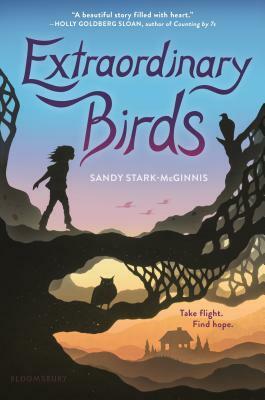 Extraordinary Birds covers topics that could easily veer into heavy-handed moralizing, but instead Stark-McGinnis has given us simple stories of complex people and allowed the reader to make connections and come to conclusions on their own. A quiet but powerful debut from an author to watch.